Posted on: December 21st, 2015	by Jennifer A. 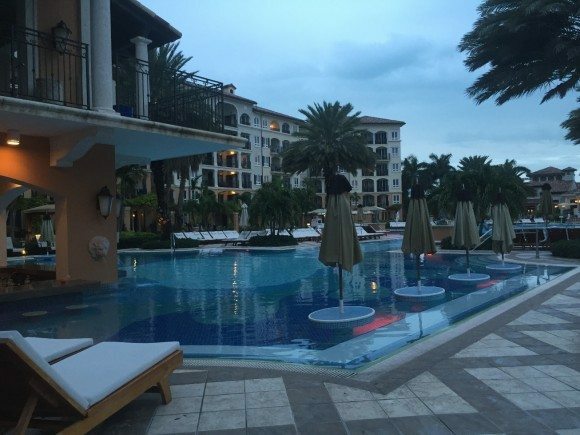 In full disclosure I visited Beaches Turks Caicos as part of a Social Media on the Sand a blogger conference I paid fees to attend. One of my most incredible adventures of the past year has got to be my trip to the beautiful resort of Beaches Turks & Caicos. It was such an honor to be invited to attend this special family blogger conference. While it wasn’t a complimentary media trip, it was well worth the money and work to get a new passport. I enjoyed the radiant sun, the soft sands of the beaches, the coolness of the water, and the friendliness of the staff. Where else can you learn about the business of blogging while having your feet in the sand? I appreciated having such an incredible location to celebrate the past 5 years of Jersey Family Fun and to start making plans for the future. to have my husband and 3 boys with me. School and work commitments kept them from being able to come, but I can assure you given the chance to go again I will most certainly work to have them join me. Exploring Beaches through my mom eyes, I kept thinking how much my boys would love this and that. I could see my youngest playing in the sand. I could see son number 2 willing to try a new water sport and my oldest would surely have been in a hammock somewhere reading. All 3 of them would have been over the top giddy to swim up to a pool bar and order a cold drink. 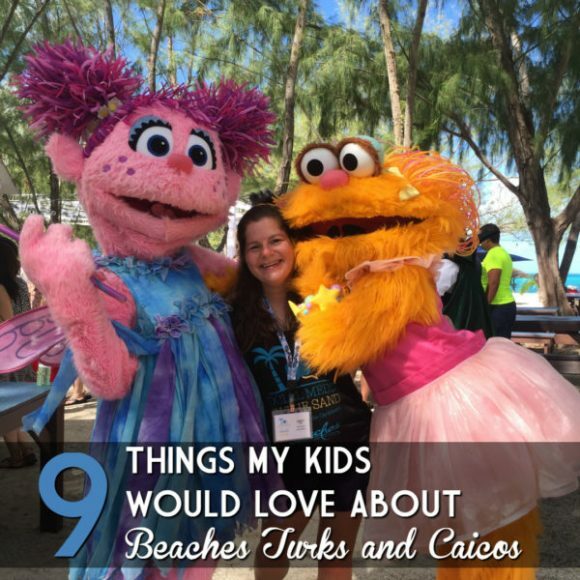 If you’re considering a family vacation to Beaches Turks & Caicos consider these reasons your kids would LOVE to visit. What kid doesn’t love ice cream? I admit, I love it too. I loved that almost anytime of day or night I could head over to Bobby Dee’s for an ice cream sundae or milkshake. 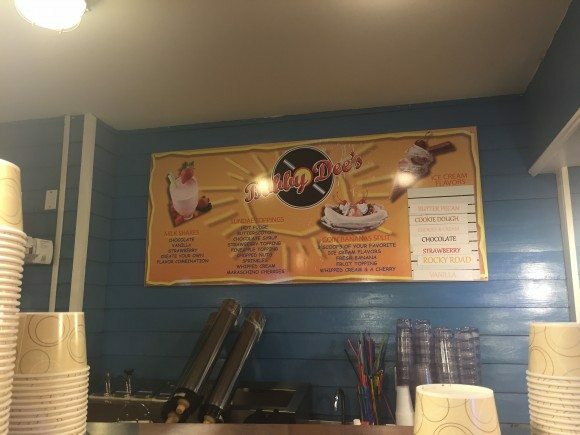 With so many activities to enjoy at Beaches I know my kids would be asking for ice cream a lot and Bobby Dee’s would be ready. The restaurant and ice cream shop are open daily 11 am – 6 am. You can even swim up to the counter for your favorite milkshake or an ice cream sundae. Babies, little kids, big kids, tweens, and teens…. Beaches seems to have a program for every age. There are pool and beach games. There are crafts. For the littlest of kids, Camp Sesame has adorable indoor safe places and their own pool. For the older kids, tweens, and teen places there are ‘cool’ places to hang out and socialize. 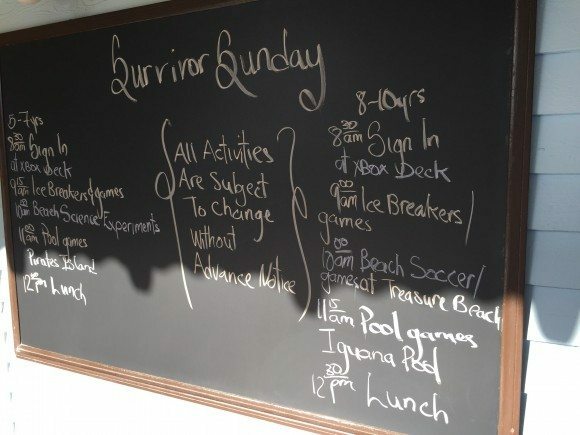 Chalkboards list the weeks’ schedule of activities. Kids camp is included as part of the all inclusive travel packages. 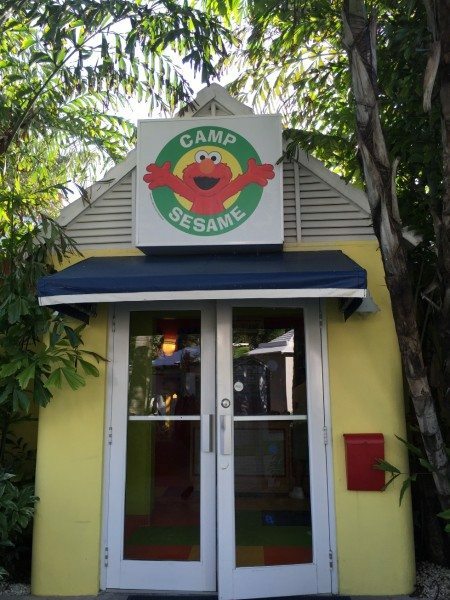 You can see more pictures from inside the Camp Sesame center and other kids areas in this Facebook album. No, my kids weren’t with me but yes I had to check it out for our awesome readers and so that I know for when I do bring my kids. It’s great to know that families can take a vacation that gives them activities to do as a family and the grown ups time alone as well. Knowing my kids can have safe, supervised fun means… maybe a family vacation is what we need so mommy and daddy can finally have some date time. Swim up bars that had several kid-friendly drinks and smoothies kids could enjoy while in the pool or sitting pool side. The pools were deep enough to swim in but not too deep. At 5′ 2″ I could stand in the water without it going over my head. Plenty of complimentary towels available pool side. Ample seating as well. I never had a problem finding a lounge chair to leave our belongings on while I swam or when I was ready to lay in the sun. Throughout the Beaches property are several displays with this signage. Every day of the week there seems to be some kinds of family night going on. During my visit, there were nights of dancing in the water park area, dancing in the clubs, a beach party and I am sure more that I missed out on. 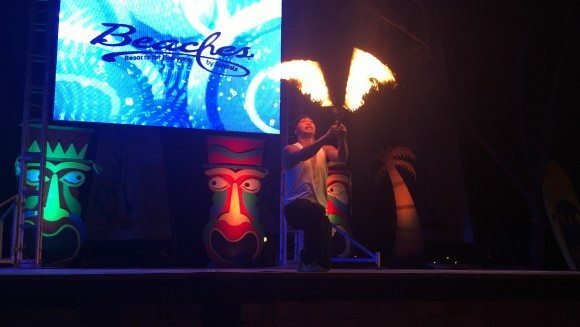 During my favorite family night there was an all out luau with music, food, limbo, maypole dancers, and a fire-eating performer. 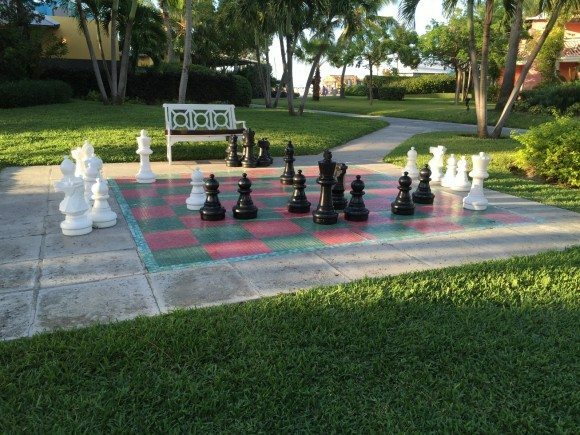 Beaches Turks & Caicos had so many water sports that weren’t just limited to adults. 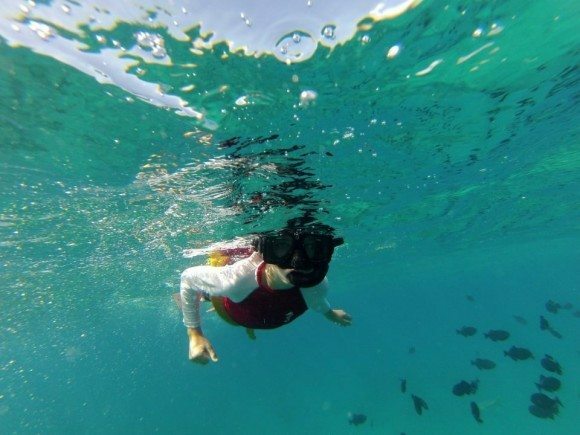 There is hobie cat sailing, kayaks sailing, an aqua cycle to ride, snorkeling, diving, and more. These would be great activities to do with my boys for some unforgettable experiences. Kids can take lessons with or without their family. 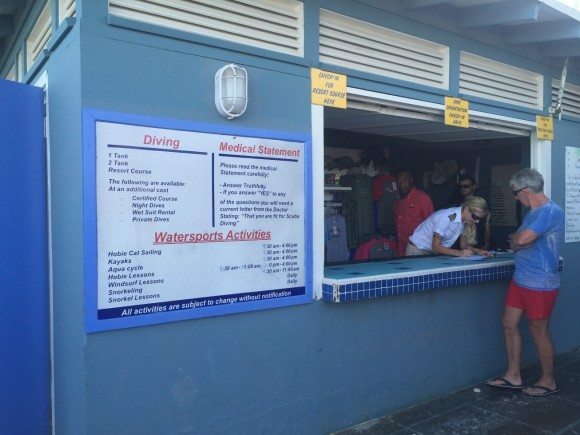 You can bring your own life jackets and equipment or rent your own. Photo Credit Shelby Barone from OC Mom Blog. The beaches of Turks Caicos extends for miles. 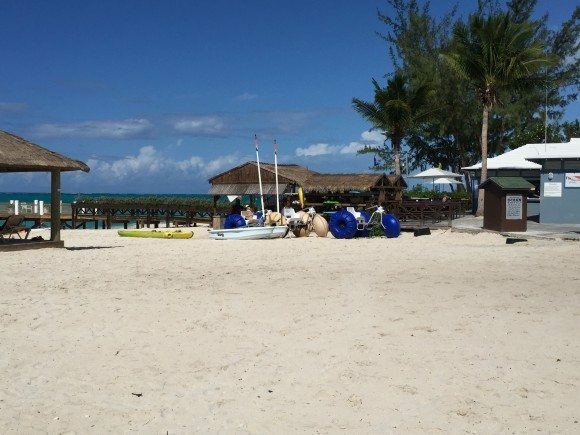 What’s great about them is that there is plenty of beach to explore both at the shoreline and back on the other side of the beach front cabanas. If you’re nervous about little ones getting to close to the water, but still want playing in the sand time, check out an open area like below. 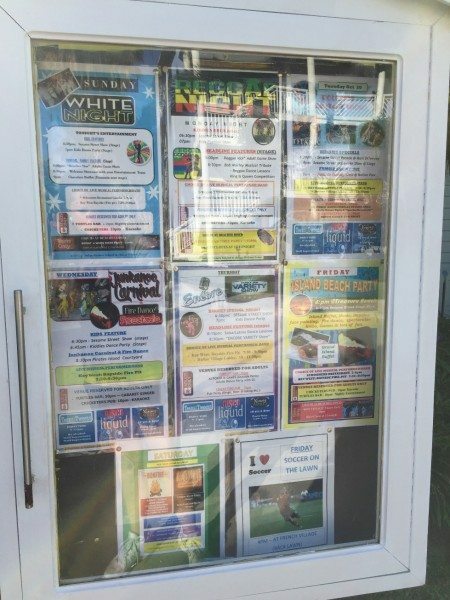 It’s near the water sports area. You can see the shore line but the pavilion acts as a barrier to a direct path to the water. There was lots of sand on the playground too. There were also lots of open green spaces. With benches, chaise lounges, hammocks, and other comfortable seating I could certainly see my oldest getting comfortable with a good book. I’d likely be in the next hammock sipping on a frozen lemonade and resting. 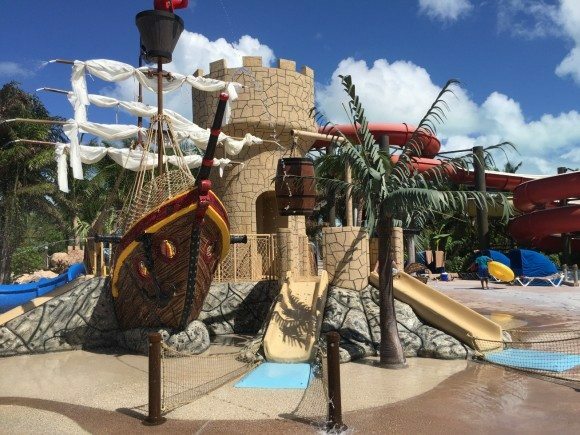 Pools where you can swim up for a cold drink, a pirate’s cove where you can hide and look out over the water park, water slides for every thrill level… and much much more. The Treasure Island water park had something for everyone. There was a splash pad where cute sea creatures sprayed water over a soft ground. The path of the lazy river was beautiful and relaxing. There were several water slides, a surfing simulation, and a pirate playground. I might not have my boys with me…. but I still enjoyed the water park. 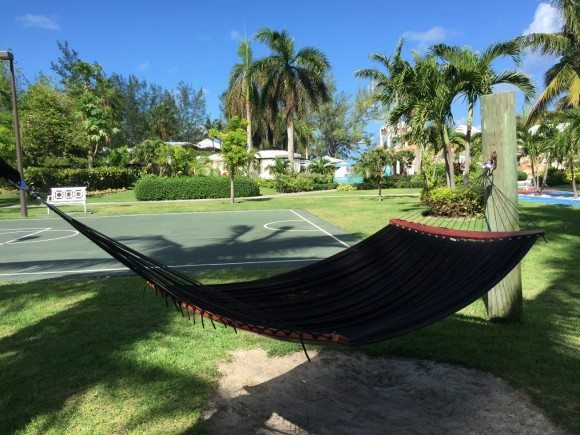 There are chairs and towels nearby and even Bobby Dee’s is near so you could easily spend a whole day in this area of Beaches Turks & Caicos. 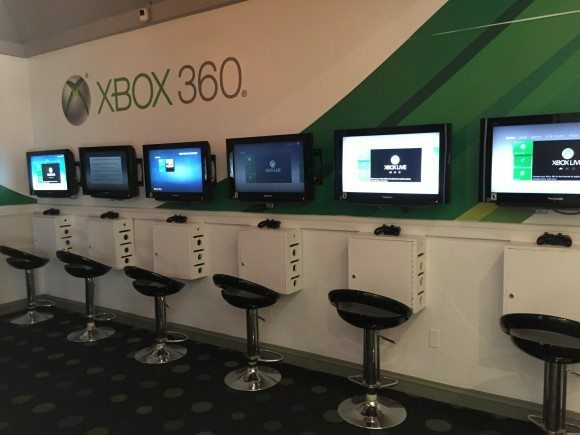 If your kids are traditionally glued to their screens you can lure them to Sandals with promises of letting them play in the X Box Lounge. But encourage them to join you FIRST in some off screen gaming. Make an off-screen gaming memory! Beaches had a few of these open areas that had kid-size chess games set up. There are also tennis courts, shuffleboard courts, and basketball courts outside in open spaces and pool tables and air hockey tables in pavilion areas. 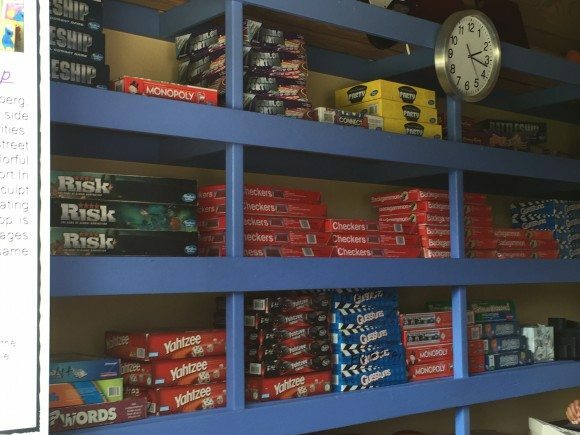 Families can also check out board games at the activity center near the playground and use them in the open spaces or back in their rooms. Are we ever too old to enjoy Sesame Street? I think not. 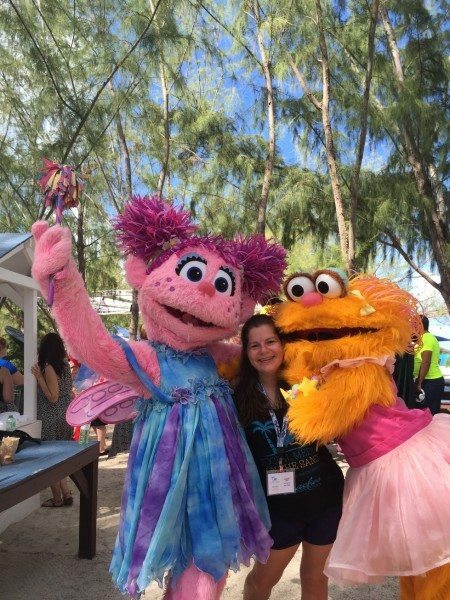 During one morning of Social Media on the Sand my fellow bloggers and I got to hang with the characters of Sesame Street. We were all clamoring for pictures with them. At Beaches, families can enjoy breakfast with the Sesame Street characters or arrange for one to visit at bedtime. But be ready with those cameras; you never know when you might just catch one walking around. What activities would your kids want to do at Beaches? 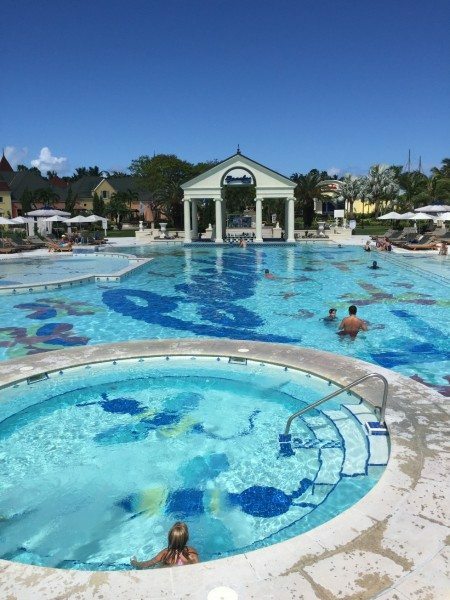 If you’d like to learn more about Beaches Turks & Caicos visit their website. 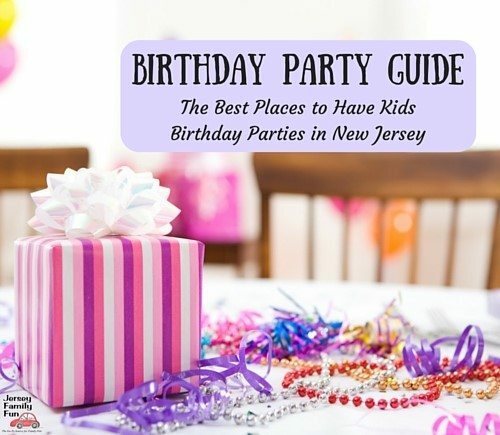 To arrange a feature on your location contact Jennifer Auer, Jersey Family Fun publisher. You can see more of our Beaches Turks Caicos pictures in this Facebook album. See a preview below. 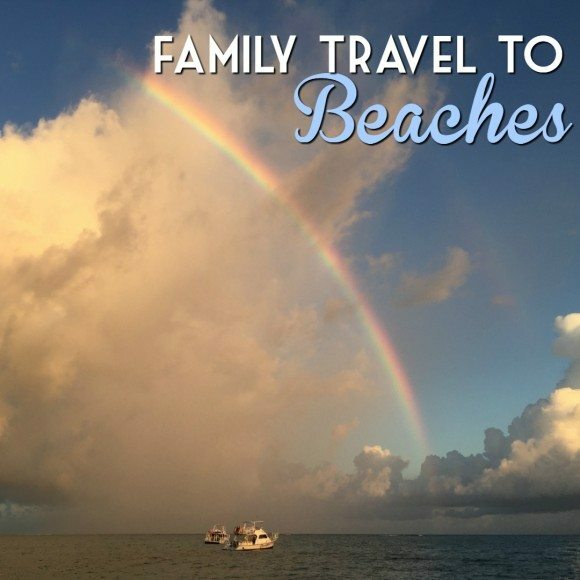 Coming soon … we’ll share more about this Beaches travel experience we’ve had and others we will be having.